TWO MASKED BANDITS DREW THEIR pistols as they closed in on a stagecoach. The lead desperado steadied himself in the saddle as he took careful aim at his target. The second did the same. Their pistols roared in unison as their horses galloped through white clouds of gun smoke. “Heeyah!” shouted the driver. The portly man shook the reins, urging his four horses to run faster. He chanced a glance over his shoulder at the approaching outlaws. The driver turned back and shook the reins harder. The man sitting next to the driver spun in his seat and aimed a shotgun at the villains. The gun roared, and flames erupted from both barrels. One of the gunmen flew from his saddle; the masked man tumbled to the ground. “And that’s why they call it ‘riding shotgun,’?” my brother, Joe, announced. The other outlaw aimed his six-shooter and fired. The man riding shotgun dropped his weapon and fell from the top of the stage. He rolled to a stop in the soft dirt as the chase passed him by. When the bandit fired again, the driver went down. The man slumped forward, dropping his reins. Now the stagecoach was running wild with no one to steer or stop it. Suddenly one of the coach doors flew open. A cowboy wearing a white hat leaned out and blasted a six-shooter of his own. The remaining outlaw tumbled off the back of his horse. The cowboy holstered his pistol and climbed out of the cab. He scrambled up to the stagecoach’s roof and made his way to the front. Without hesitation, the cowboy leaped onto the back of one of the coach’s horses, then carefully stepped onto the rigging between the galloping steeds. Crouching low, he worked his way forward and grabbed the reins. He leaned back and pulled hard on the leather straps. Soon the runaway coach pulled to a complete stop. The audience erupted in applause. Joe and I joined in as the cowboy hopped to the ground and gave a long bow. Joe and I weren’t sitting in a movie theater watching a western, though it felt like we were. (My brother likes to make comments throughout movies too, which drives me nuts.) No—Joe, Mom, Dad, Aunt Trudy, and I were sitting with most of Bayport in the bleachers of the high school stadium. We had the rare treat of watching Wally Welch’s Rodeo and Wild West Show. Several members of the audience were happy to oblige, including my brother. The two outlaws, already back on their horses, waved to the cheering spectators. The man riding shotgun had climbed back onto the coach and waved as well. The hero cowboy sat on the back of one of the horses and tipped his white hat to the crowd. The driver came out of his slump, reins in hand. 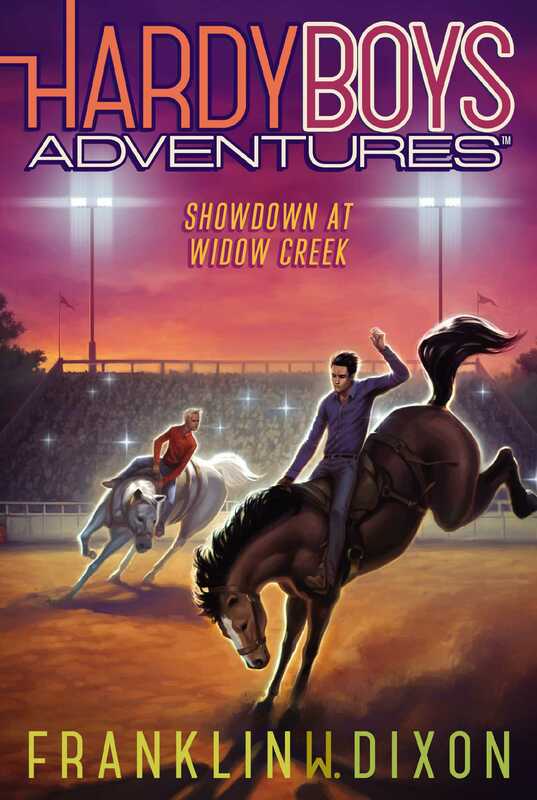 “Yee-haw!” he shouted as he slapped the reins onto the horses’ backs. The animals bolted forward into a gallop, pulling the stagecoach around the stadium in a victory lap. As it passed the bleachers, Wally Welch waved to the crowd, a wide grin spread across his gray-bearded face. The stagecoach had never been in danger of running wild. During the entire chase, it had made the same wide circle around the dirt-covered center of the stadium. The entire field had been modified for the event. Truckloads of dirt had been carted in, and temporary metal fence panels surrounded the area. A couple of cowboys swung open two of those ­panels, allowing the stagecoach and riders to exit the field. This wasn’t our usual Friday night out. If one of us didn’t have a date, you could usually find my brother and me hanging out with our friends at the Chomp and Chew—the diner with the best hamburgers in Bayport. Of course tonight most of our friends were at the show (a point Joe had made to get me here). Plus, how often does Bayport get to see an honest-to-goodness rodeo? Joe had always been more of a westerns fan than me, but I had to admit that I was enjoying the show. We had seen trick roping, bronc busting (cowboys trying to stay atop a bucking horse), and a few other historical reenact­ments like the stagecoach robbery. The audience applauded as a young girl rode into the stadium. She looked to be about seventeen and rode a large brown-and-white horse. Her auburn hair was pulled back into a long braid. She kicked her horse into a gallop and began a loop around the field. “Uh-huh,” was all I could reply. I have to admit, I was instantly enamored with Sarah Welch. Even from several yards away I could tell she was pretty cute. And, as it turned out, she was quite talented, too. Once Hondo had reached a steady pace, Sarah kicked her boots out of the stirrups and hopped onto the seat of the saddle. She slowly stood straight as the horse ­continued to gallop. The audience cheered at the sight. Sarah then dropped to a seated position with both legs draped over one side of the saddle. For a few gallops, she rode sidesaddle, the way ladies wearing long skirts used to ride. Sarah had a unique saddle. Instead of the usual short ­saddle horn protruding from the top, hers seemed to be about a foot long. It was thin and wrapped with tape. She didn’t ride sidesaddle for long. She grabbed the saddle horn with both hands and slid off the horse. Both feet hit the ground and her legs shot up and back. Still holding the horn, she swung her body over the back of the horse until her boots hit the ground on the other side of the horse. Once again, she used the ground to propel herself up. Her legs scissored wide as they flew across the horse. The audience cheered even more. “Just like a pommel horse,” said Joe. He was right. Sarah moved her body around Hondo similar to the way a gymnast would train on a pommel horse, only Sarah’s moves were more impressive because a pommel doesn’t gallop around a stadium. Sarah continued to perform breathtaking moves atop the loping horse. With her back pressed against the animal’s side, she raised both legs straight out. Then, back on the saddle, she stood on one leg with her other leg pulled up behind her. After each elegant maneuver, she would easily drop back into the saddle as if it were nothing. As her performance ended, Sarah put a foot in a stirrup and hooked the other behind the tall saddle horn. She extended her body so that it was perpendicular to the horse. She spread her arms as they moved around the field one last time and waved to the audience. “How about another hand for Sarah Welch,” urged the announcer. The audience didn’t have to be asked twice. They cheered wildly as Sarah galloped off the field. “No, thank you,” said my dad. The rest of my family shook their heads. Everyone but Joe, who also rose to his feet. “I’ll join you,” he said with a grin. I sighed. There was no fooling him. “Do what?” I asked, stepping down the bleachers toward the walkway. “I just want to congratulate her,” I said. We walked past the concession stand toward the back of the stadium. On the way we passed several livestock trailers, a covered wagon, and the stagecoach we saw earlier. Two cowboys led the brown-and-white horse past us. I figured they were performers since they had bandannas covering their faces. However, for such a well-trained horse, Hondo seemed to resist being led. After a few more steps, I stopped. Something wasn’t right. The masked men weren’t the same ones we’d seen in the show. These cowboys weren’t dressed in flashy shirts and vests like the ones in the rodeo. And why would the performers still be wearing bandannas over their faces—especially in the midday heat? “What’s up, bro?” asked Joe. Before I could reply, I heard a horse neigh behind us. Joe and I turned to see the men trying to lead Hondo into a trailer. The horse reared back and shook his head. One masked man held fast to the lead rope, while the other smacked the horse’s rump with his hat. “Something seem strange to you?” I asked. The horse neighed once more before finally entering the trailer. The men shut the door behind the reluctant horse. Finally my brother had reached the same conclusion as I had.